“Historic buildings are a proud and significant part of our, and every nation’s heritage. They are an irreplaceable element of the collective memory of local communities ........ They contribute both to our sense of identity and to that regional distinctiveness which is so valuable and so vulnerable.” Sir Jocelyn Stevens, Past Chairman, English Heritage From its lofty position, St Andrews overlooks the wide valley of the River Worfe, and can be seen from the nearby settlements of Grindle and Grindleforge, thereby securing its position as the single unifying building in the Parish. The Church remains the only public building in a small and sparsely populated rural Parish, and it is used for both regular religious services, and for any local gatherings, events, or meetings. Its importance to the history of the Parish and as a focal point for the community cannot be underestimated. Historically, the Church has largely given Ryton and Grindle its identity. It has given Ryton two former vicarages, that have shaped the development of the village. The first, Ryton Rectory, subsequently became a Girls Boarding School, and then a school for children with learning difficulties. It is now Ryton Hall comprising a number of residential apartments, and the second vicarage became another important residence called Ryton House. It has spread the name of Ryton far and wide, by association with Colonel William Kenyon-Slaney who scored the first England goal in international football in 1873 and who is now buried in the churchyard; the Reverend B Eyton who wrote ‘Antiquities of Shropshire’ and was vicar for 40 years; and George Fieldhouse Molineux whose family gave their name to Molineux House and the football ground in Wolverhampton, and who was also vicar between 1798 and 1838. The last family member to own Molineux House, Charles Edward Molineux, was born at Ryton Rectory. The Church has also been important enough to attract prominent London Architects and Builders, F & H Francis & Sons, to work on the north aisle extension in 1886; to include sculptural works by Richard Westmacott who became ‘Mason for Kensington Palace’ by Royal Appointment; and to have the churchyard laid out by Romolo Piazzani, a famous Italian Landscape Architect, and reputedly the illegitimate son of the King of Italy. 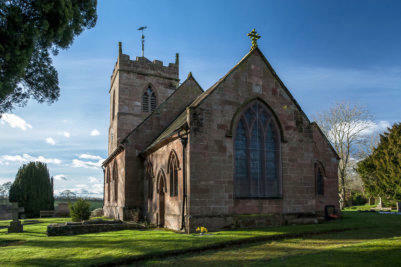 Ryton Church was Listed Grade II in 1984 under English Heritage Building I.D. 417337. The listing confirms the building as early C18 but with evidence of earlier medieval construction, and cites (amongst others) the architectural features, the decorative style, the stained glass windows, and the pews with brass candelabra. It refers to the monuments, including those by Westmacott. Kelly’s Directory of 1885 lists extensive restoration and re-modelling works carried out by Francis Brothers (sic) in 1874 at a cost of £1300, and this was followed by the north aisle extension in 1886. The original Architects drawing for the 1886 extension hangs in the Vestry. There is a long history of the Ryton Church building being supported by benefactors and local residents. There is record of stained glass windows being dedicated to and inserted by Parishioners, and the 1874 restoration is likely to have been funded by public donation. The construction of the 1886 north aisle extension can largely be attributed to a single benefactor, and the upkeep and maintenance of the building has been funded by the Parishioners throughout its long history. Ryton and Grindle do indeed have a long collective memory and sense of identity that contributes to its distinctiveness, and much of this can be attributed to its most prominent historic building. The vulnerability of this cornerstone of the community requires that once again the Parishioners must play their part in preserving Ryton Church’s place in the local and national heritage. “Historic buildings are a proud and significant part of our, and every nation’s heritage. They are an irreplaceable element of the collective memory of local communities ........ They contribute both to our sense of identity and to that regional distinctiveness which is so valuable and so vulnerable.” Sir Jocelyn Stevens, Past Chairman, English Heritage From its lofty position, St Andrews overlooks the wide valley of the River Worfe, and can be seen from the nearby settlements of Grindle and Grindleforge, thereby securing its position as the single unifying building in the Parish. The Church remains the only public building in a small and sparsely populated rural Parish, and it is used for both regular religious services, and for any local gatherings, events, or meetings. Its importance to the history of the Parish and as a focal point for the community cannot be underestimated. Historically, the Church has largely given Ryton and Grindle its identity. It has given Ryton two former vicarages, that have shaped the development of the village. The first, Ryton Rectory, subsequently became a Girls Boarding School, and then a school for children with learning difficulties. It is now Ryton Hall comprising a number of residential apartments, and the second vicarage became another important residence called Ryton House. It has spread the name of Ryton far and wide, by association with Colonel William Kenyon-Slaney who scored the first England goal in international football in 1873 and who is now buried in the churchyard; the Reverend B Eyton who wrote ‘Antiquities of Shropshire’ and was vicar for 40 years; and George Fieldhouse Molineux whose family gave their name to Molineux House and the football ground in Wolverhampton, and who was also vicar between 1798 and 1838. The last family member to own Molineux House, Charles Edward Molineux, was born at Ryton Rectory. The Church has also been important enough to attract prominent London Architects and Builders, F & H Francis & Sons, to work on the north aisle extension in 1886; to include sculptural works by Richard Westmacott who became ‘Mason for Kensington Palace’ by Royal Appointment; and to have the churchyard laid out by Romolo Piazzani, a famous Italian Landscape Architect, and reputedly the illegitimate son of the King of Italy. 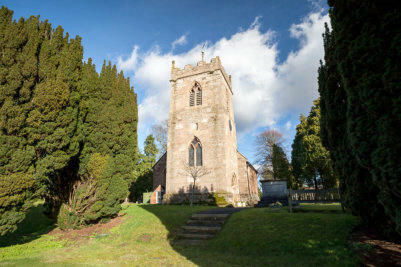 Ryton Church was Listed Grade II in 1984 under English Heritage Building I.D. 417337. The listing confirms the building as early C18 but with evidence of earlier medieval construction, and cites (amongst others) the architectural features, the decorative style, the stained glass windows, and the pews with brass candelabra. It refers to the monuments, including those by Westmacott. Kelly’s Directory of 1885 lists extensive restoration and re- modelling works carried out by Francis Brothers (sic) in 1874 at a cost of £1300, and this was followed by the north aisle extension in 1886. The original Architects drawing for the 1886 extension hangs in the Vestry. There is a long history of the Ryton Church building being supported by benefactors and local residents. There is record of stained glass windows being dedicated to and inserted by Parishioners, and the 1874 restoration is likely to have been funded by public donation. The construction of the 1886 north aisle extension can largely be attributed to a single benefactor, and the upkeep and maintenance of the building has been funded by the Parishioners throughout its long history. Ryton and Grindle do indeed have a long collective memory and sense of identity that contributes to its distinctiveness, and much of this can be attributed to its most prominent historic building. The vulnerability of this cornerstone of the community requires that once again the Parishioners must play their part in preserving Ryton Church’s place in the local and national heritage.